Blackrock Mountain has come and gone and many new cards have entered into the game. Unfortunately, there hasn’t been much of a shift in the meta game from it and few of the new cards have seen much use. Maybe players are just being stubborn and sticking to the decks that already worked, so we may see some more of these cards gain popularity over time. Still, these cards have made noticeable splashes in their own right and are most worth looking into. Also, for the sake of those playing on a budget, I’ve marked each entry on this list with the wing that the card comes in so you’ll know just how deep into the mountain you really need to worry about. The whole idea of cards that cost less based on how many minions die on a turn proved to be far less useful than anyone expected. However, the Volcanic Lumberer has a strong enough body at a fair enough cost to prove practical. This one is really at it’s best in Arena mode where minions are always going to be trading into one another and the mana cost of this card is bound to be fairly cheap for what you’ll get out of it. Even at 7 mana, it’s still a powerful minion that can lock the game in your favor. While it can work in constructed as a follow-up to using Force of Nature to control the board, the old Combo Druid is still more viable and it can’t combo off Force of Nature if you’re using that to attack your opponent directly. This one is personal favorite of mine even if it is fairly gimmicky. You do need to tailor your deck around it as you don’t want to summon measly minions with it. However, if you can get something like an Injured Blademaster early on, it will give you a great lead. It’s also finally given me a reason to run Sen’jin Shieldmasta again. 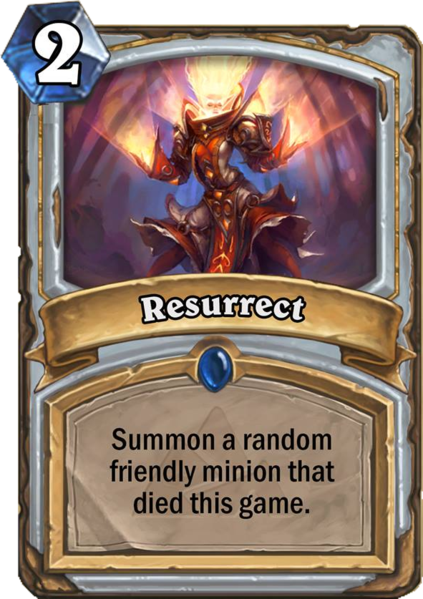 It’s a fun card, but we again have a clash with the old Priest decks that are still more viable. It’s worth experimenting with, but it’s not going to shake up the meta any time soon. People freaked out when this card was first revealed and, while it is good, it’s nowhere near as strong as was originally suspected. 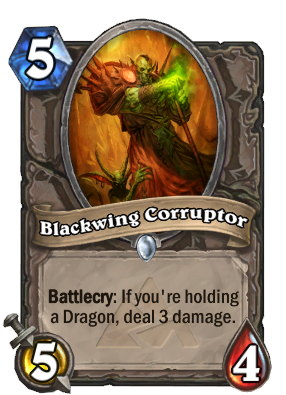 You really need to focus your deck around dragons to get good use out of this guy and he’s useless in Arena as a result. If you are running a dragon deck, he suddenly becomes a linchpin in controlling the board. The big problem is that dragon decks just aren’t that strong right now. Maybe the next expansion will change things, but there just aren’t enough good cards working with the concept right now. However, if you want to try out some dragon decks right now, the Corruptor is a must-have. 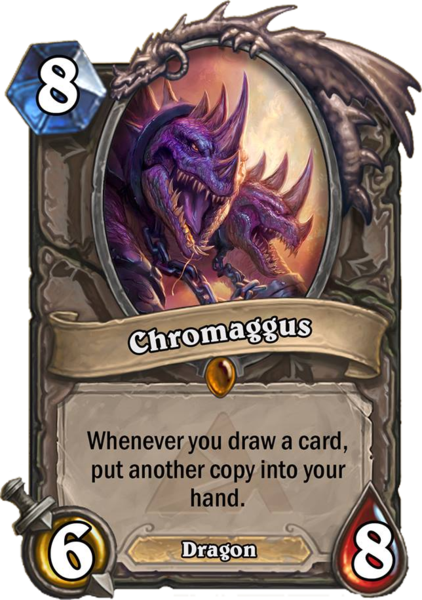 Chromaggus is a lot like Ysera. Not too long ago, that would have been a massive compliment. In the current meta, it just means that he’s okay. If you’re already ahead, Chromaggus can easily seal the game for you. If you’re behind, he’s far to slow to get you caught up. Given how fast and aggressive the meta currently is in Hearthstone, there just aren’t many good opportunities to bring him out. There’s also the fact that your opponent gets a chance to react and shut down his effect entirely, making him a step below Ysera. He’s still a good card, but the time isn’t quite right for him. This has become a popular pick in Mage decks, but don’t overestimate it. 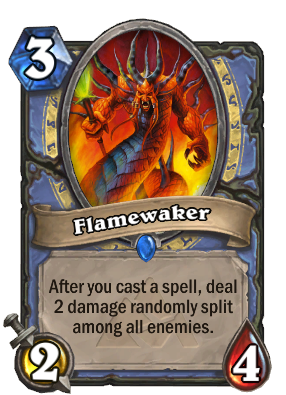 Flamewaker is a card designed for Mages focused on keeping control of the game and he’s not something to casually toss into any deck. He’s especially bad in Arena where spells are rare and his effect will have little impact. That said, you shouldn’t underestimate him either. In spell-heavy decks, it can be pretty devastating with the amount of it can quickly dish out. With the right build, he is definitely a valuable asset. Just remember that spells are a valuable resource and that the random damage isn’t always reliable. Now we’re getting into the really good cards. While dragons haven’t taken off as much as we’d hoped, this is still an extremely powerful card. Along with a solid stat line, the fact that its mana discount on your next dragon holds until you play that dragon almost guarantees that you’ll get good value out of this card. Even if you only run one other dragon in your deck, you’ll get all the tempo you need. 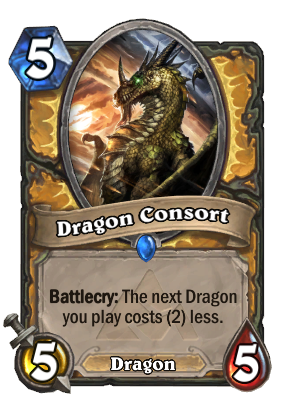 Dragon Consort is certainly worth mixing into your Paladin decks. As I said at the beginning, the meta has been pretty stubborn lately and players have been sticking with the decks that were already working before. Fortunately, that’s great news for new cards that work with old decks. 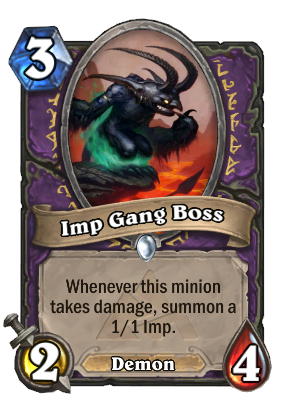 Enter the Imp Gang Boss, the new headliner for Zoolock. With his ability to spawn imps whenever he takes a hit, your opponent will be hesitant against playing smaller minions and struggle endlessly to try and clear your board. Whether you’re playing in constructed or the Arena, Imp Gang Boss is an offer you can’t refuse. Again, if it worked before Blackrock, it’s only gotten more popular afterwards. Face Hunter was already one of the strongest, if not the strongest, decks in the game. Spells that deal 3 damage for 2 mana are always really good. Put the two together and the already overwhelming number of Hunters on ladder has only increased. 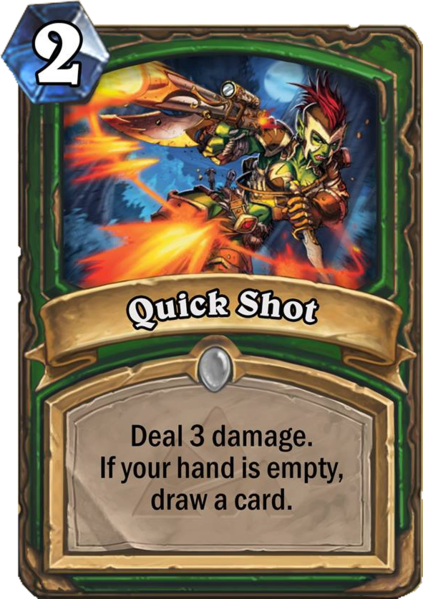 Not only would 3 damage be good on its own, but it also gives you card draw if your hand is empty after casting it, making it the perfect tool for aggressive Hunters. If there is one card from Blackrock that is going to need a nerf, it’s this. It the meantime, please enjoy being a scumbag! This is easily the best new Warrior card to be added with this expansion. Yeah, it isn’t Warrior specific, but it offers the class so much more than Axe Flinger or Revenge ever will. 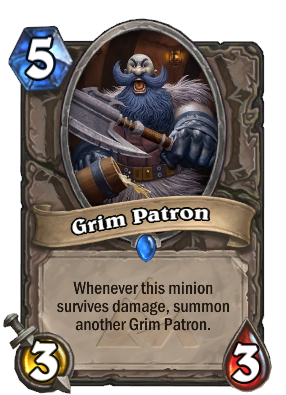 Grim Patron Warrior (or Drunken Warrior as I like to call it) has taken off as one of the legendary decks that can easily be built with a free account like Face Hunter and Zoolock. However, while those other budget decks can handle with a brain-dead approach and still win, Patron Warrior still demands a great deal of strategy and finesse to work despite my little nickname for it. Play it recklessly and you’ll quickly throw away key resources. While I still curse Blizzard whenever a Face Hunter crushes me despite making stupid plays, I audibly cheer anytime I lose to a Patron Warrior because their plays are intricate and worth losing to. We need more clever decks that can be built on a budget. Yeah, this wasn’t much of a surprise. While Thaurissan isn’t quite as universally useful as I expected, being great in about 95% of all decks out there is still pretty good. 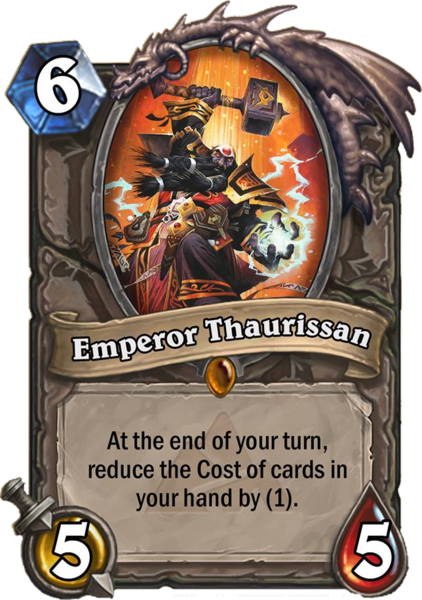 Not only does Thaurissan make a lot of good decks better, he enables all manner of combo decks that were once thought impossible. Even if you aren’t going for a combo, Thaurissan is just an incredibly useful card in general as he makes every play easier to make. The only decks that he doesn’t work in are the ones that aggressively dump their hands out onto the board as quickly as possible, but literally every other deck you can make will be made stronger with him. The only downside is that he’s singlehandedly killed off my beloved Mill deck forever. Yeah, filling your opponent’s hand to try and burn cards doesn’t work so well when everyone can make those cards really cheap really easily. 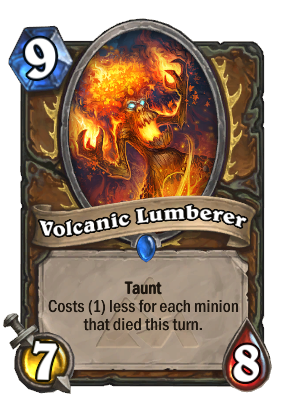 That aside, Thaurissan is easily the best card in all of Blackrock. Interestingly, many of the very best cards in Blackrock come in the very first wing and the remaining great ones are just two more wings in. While it is in your interest to pick up the full adventure, you can easily get by with just the first one or two wings. It’s certainly convenient for those of us playing on a budget, but it also highlights how little impact this expansion has ultimately had. Are there any cards you feel deserve a mention? Let us know what your thoughts on Blackrock Mountain and all of the cards it introduced in the comments below.